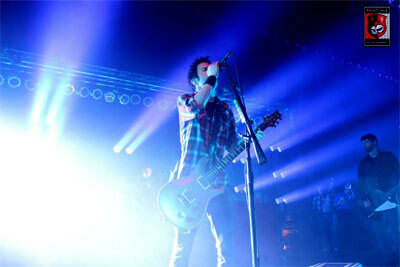 On Wednesday, March 14, 2012, the tour featuring Chevelle, Middle Class Rut, and Janus came to Sokol Auditorium in Omaha, NE. Concert season is starting to pick up in the Midwest now and along with that comes the nice weather which held true Wednesday night. We couldn’t have asked for a better night with the weather and show itself. Janus started the night and got the fans off to a great start for a great show the rest of the night. We had a chance to interview David Scotney, lead singer for Janus, before the show and we talked about the two singles they have fans sing along with, which proved to be true that night. “Eyesore” was their first well-known single and they currently have a single called “Stains” off their upcoming album. Their new album “Nox Aeris” will be released on March 27th. Next on stage was Middle Class Rut, the duo from Sacramento, CA. These guys showed that you don’t have to have many members of a band to rock out. The band consists of Zack Lopez and Sean Stockham. They both sing in the band and one plays guitar and the other plays drums. Their two singles that fans were singing along to were “New Low” and “Busy Bein’ Born.” We also had the chance to sit down with these two guys before the show and they talked about why there were only two members in the band rather than four or five like most other bands. They told us that they were both really good friends and it just worked out to have only two in the band and it’s been working for them ever since. Overall it was a fantastic night and everyone there had a great time. Be sure to check out all of the bands on iTunes and on Facebook. Below are links to our interviews and photos from the night. Article courtesy of Jeremy Lafrentz of Backstage Entertainment. Check out their interviews, photos and contests to win autographed prizes by going to their Facebook page and clicking “Like” on the page: facebook.com/backstgentertainment.